As I’ve written about already in my first post, I’m also a musician, although my gigs are much less frequent these days. As such, having good charts available for musicians that I’ve never played with before is essential (I just did a gig this week where I met the bass player literally 5 minutes before we started playing). Enter MuseScore, a great program for sheet music of all types (classical, jazz, rock). I don’t know how it stacks up against Sibelius or Finale, but it has the notable feature of being open source and free (which Sibelius and Finale most certainly are not). It has its quirks though, and since I’ve once again figured out how to do something that I couldn’t find anywhere with Google, I thought it was my duty to post. My issue involved a strange confluence of features that I needed to combine: slash notation and compound meter. So it seems that by default it was doing one slash per quarter note (I.e.every two eighth notes), which is totally wrong. I wanted one for every three eighth notes. What to do? This is set to 480 by default. 480 of what, exactly? I had no clue, but I guessed that 480 whatevers made up a quarter note. So if instead of two eighth notes I needed 3 eighth notes, maybe setting it to 480 * 1.5 = 720 would do the trick? And voila, indeed it did. 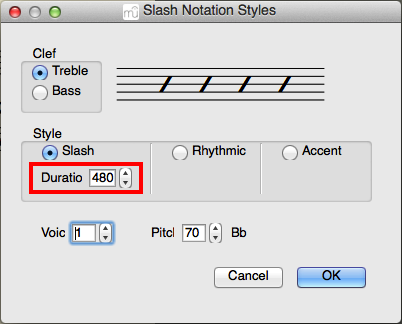 Setting Duration to 720 gave me the dotted slashes that I wanted. I was very proud of myself, and I felt the need to blog this since it was nowhere on the Internet. As I was writing this post, I did some more Googling to get the link for the plugin, and in fact came upon the developer’s page for the plugin here. 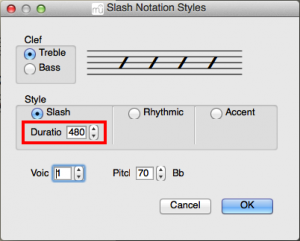 It very clearly states how to set the Duration to 720 (“ticks”, it turns out) for dotted slashes. So much for my Google skills.